Today, I want to share with you my absolute FAVOURITE story to read to students. I love it, and my students always love it too. Meet Mr Pusskins. He is owned by Emily, and she ADORES him! She brushes his fur, reads him stories and plays nicely with him. He does not like any of it, to say the very least. He runs away and joins the 'pesky cat gang' and had 'such naughty fun'. Mr Pusskins is written by Sam Lloyd. I adore reading this book, because it flows beautifully. I don't know about you, but some books I read to my students just feel 'off'. The pace, vocabulary, story structure or something else, is just not quite right. Well, let me tell you, this one is the exact opposite. It all just clicks together. It is not too complicated, yet has enough detail to add a good amount of drama to your story telling. I LOVE the cat sounds - especially the drawn out scratchy wail Mr Pusskins does when he realises he may have lost Emily for good. The story finished with Mr Pusskins having a major change of heart. He realises how wonderful it was to live with something that looks after you and is a genuine friend. Emily has put 'lost' posters up all over town and they track one another down. The story finished with Mr Pusskins admitting that he ADORES Emily. There is so much room to work with this book in the classroom. For such a seemingly simple story, there is a rich offering of discussion platforms. Talk about the structure, how the beginning almost mirrors the end, with the main character doing a backflip. The obvious 'beginning', 'middle' and 'end'. When first introducing the narrative structure to little ones, I like using this book as an example, as it has a very clear 'complication' that needs to be resolved. Discuss how the images have been drawn and how they represent the feelings and ideas discussed in the story - the sharp hard lines of Mr Pusskins and his bad attitude, and then in the end, his happy demeanour and the softened lines that illustrate him. Talk to your students about the lesson in the story, that sometimes what we find most annoying about a person or situation, may not be that bad after all. We may just have to look at them in a different light. What we desire, may not be all that we think it is! That sometimes, it is very nice to be looked after and loved. The story also provides an opportunity for you to teach a 'description' text type to your students. Ask your students to describe Mr Pusskins. They can draw a picture of him and create a 'Lost Poster' just like Emily, but adding a few sentences to describe what he looks like. You can download a writing prompt from Google Drive by clicking on the image below. Mr Pusskins also makes for an adorable directed drawing for an art lesson! I love Shanyn's new link up - Happy Snaps Sunday! Here are a few snaps from my weekend. We had a 'Spring Fair' for my daughter's school. Lots of rides, stalls and family fun. It was a gorgeous day and lovely to get out in the fresh air. My little man was intrigued by the 4-day-old baby goat and other little baby animals. My daughter spent a few hours madly creating 'Frankensteins'! We made a glyph last week from Deanna's unit, and got all inspired to make lots more. Another thing that made me smile today, was emailing these 4 winners from my Million Blog Views draw. Thank you to everyone that entered, and ladies, if you do not have my email - please contact me! 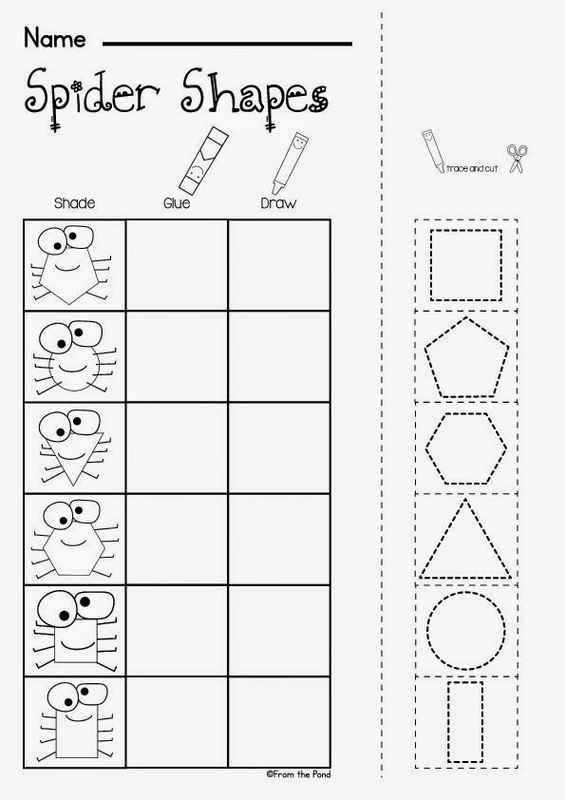 To make YOU smile, I have a 'Spider Shapes' worksheet to share with you. 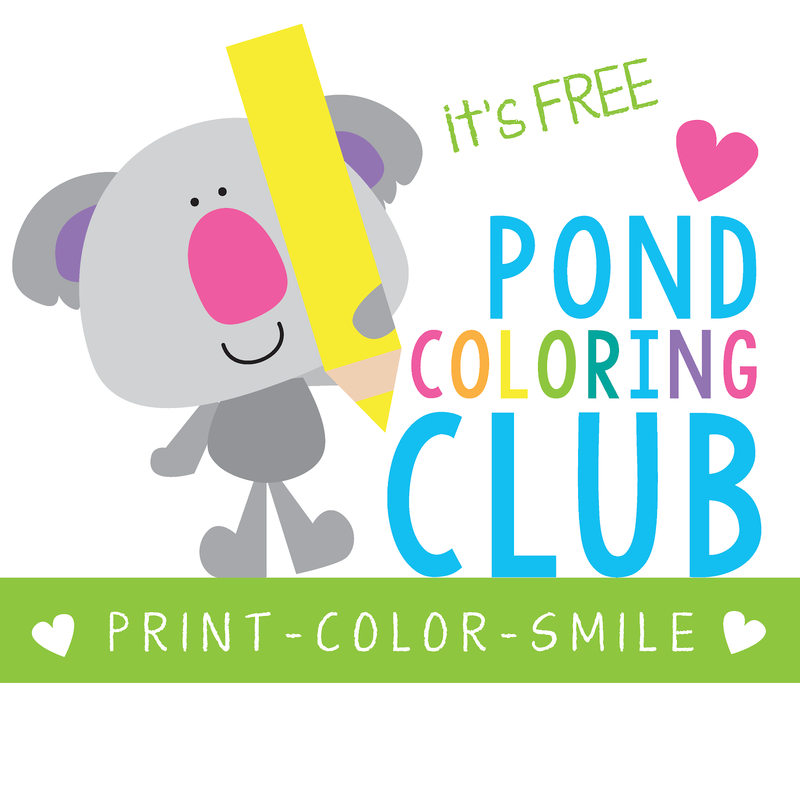 I have made a few new worksheets to add to my Worksheet Wonder Pack - and this is one of them. And to read more about the packet, click on this one! I hope you have spent Sunday smiling, like me! Thanks so much for stopping by! It's Friday. Well, somewhere in the world it is. I LOVE Five for Friday and have struggled to get on board the last few weeks. Let's do this! 1. Green drink of some sort. I am detoxing. Trying to 'reconnect' with the healthy person I used to be somewhere before the first child was born. I *could* say I am struggling with getting this consumed each day, but I am being stubborn. And blocking the nose. And closing the eyes. And skulling it. The toy ambulance in the background is a poignant reminder that things could be worse I guess. 2. Scrappy - I have been busy with random sketches and new sets. I have found my scrappy mojo again. Maybe it's the green liquid. Told you I was stubborn, I am NOT going to call it a 'drink'. 3. I am prepping a lot of fun activities for my upcoming block of work. These missing addend write and wipe cards are FREE from What the Teacher Wants AND they will fit perfectly in my Bee Busy Drawers! 4. I found these fun markers when I was doing the groceries. 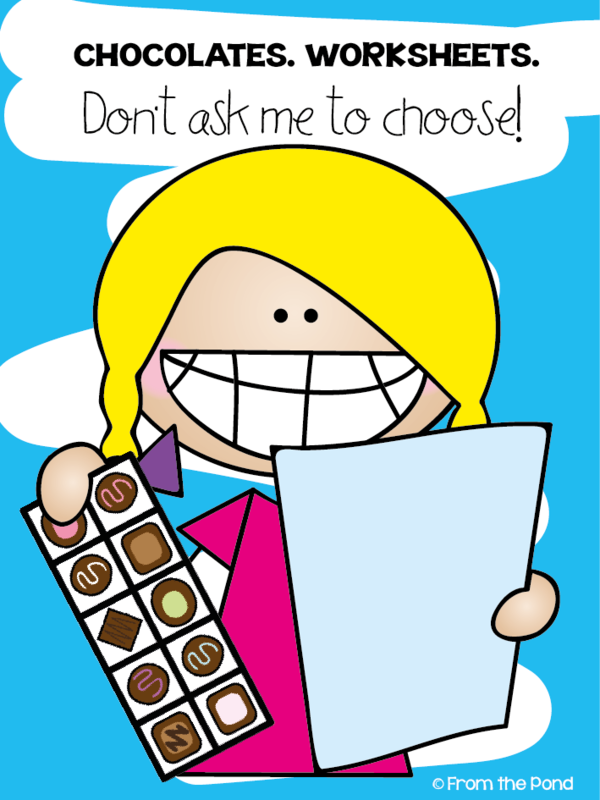 Well, to be honest, I needed things in my hand so I didn't reach for the sweets and amazingly delicious chocolates. I am SO lucky that they have confectionary and stationery in the SAME aisle. Oh, it's the small things. I am in love with these colours! 5. Today I finished a new packet for my sight word ultimate collection. It is a 'bundle' that has been around for a long time (hello eBay) and is still growing! 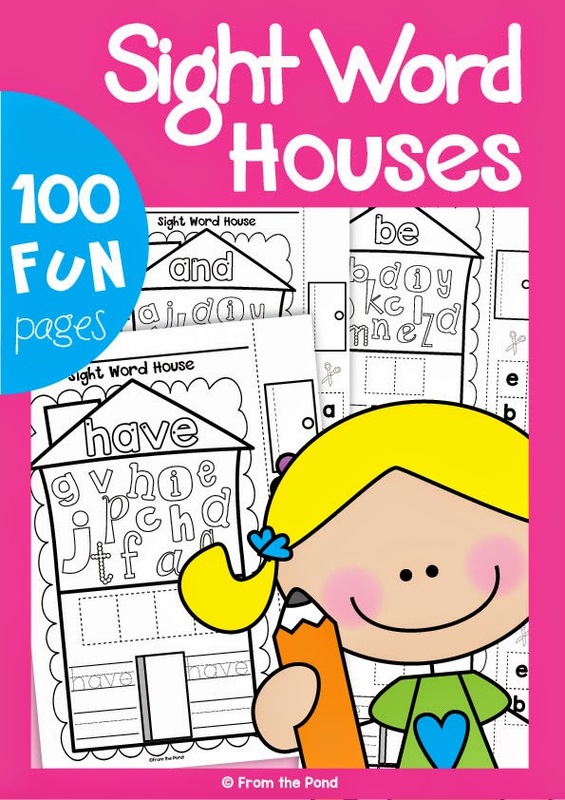 This set of worksheets has a fun 'house' theme, and your students can work on the 'Sight Word House' by tracing, writing, locating letters, cutting, pasting, ordering, writing and drawing. 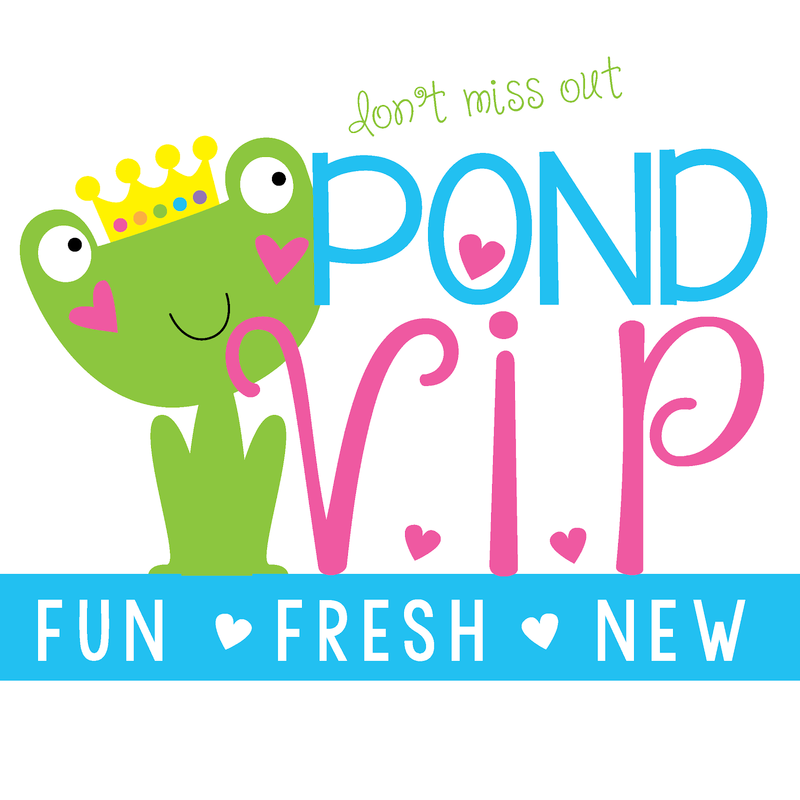 Thank you so much for visiting my blog today - don't forget to come chat with me on Facebook! 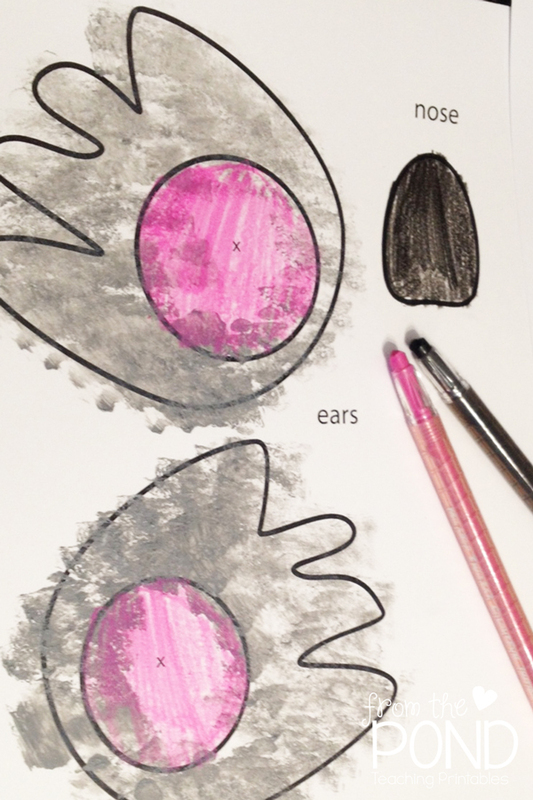 Head over to Doodle Bugs to read more Friday randomness! My little 'ol blog reached 1 million views today! What?! How!? I remember getting to a couple of hundred hits, like it was yesterday. Except it was 2011 when that happened. Well, I DO still have a 2011 calendar up. True story. I don't live for the moment. I live like it was 3 years ago. All. The. Time. THANK YOU! I am so humbled. It is not so grand compared to some of the super-teaching-blogs out there, but it is HUGE to me. 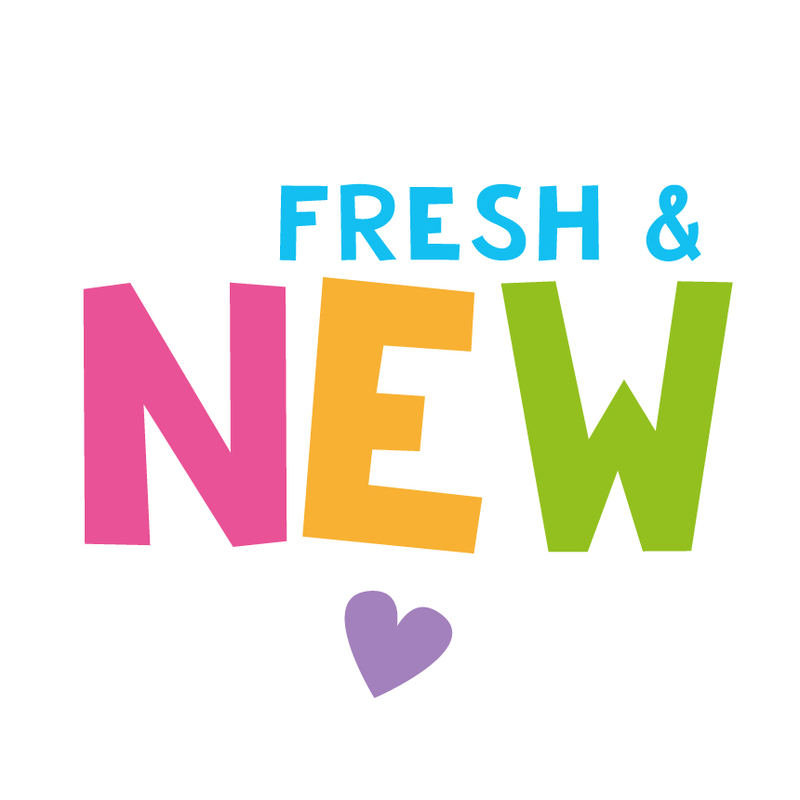 I started my blog, having never really read many blogs before (me? .... who would have thought?!). I still don't feel like a 'blogger' or actually really know what I am 'supposed' to be doing. I was just very much attracted to the idea of having a free space to write a few thoughts, and most importantly connect with my 'buyers' in a more personal way. And post photos! Facebook for teachers was minimal back then, and Pinterest was not around. My blog has always had a strong link to my digital teaching resources - I wanted them to have a voice and be able to explain themselves! 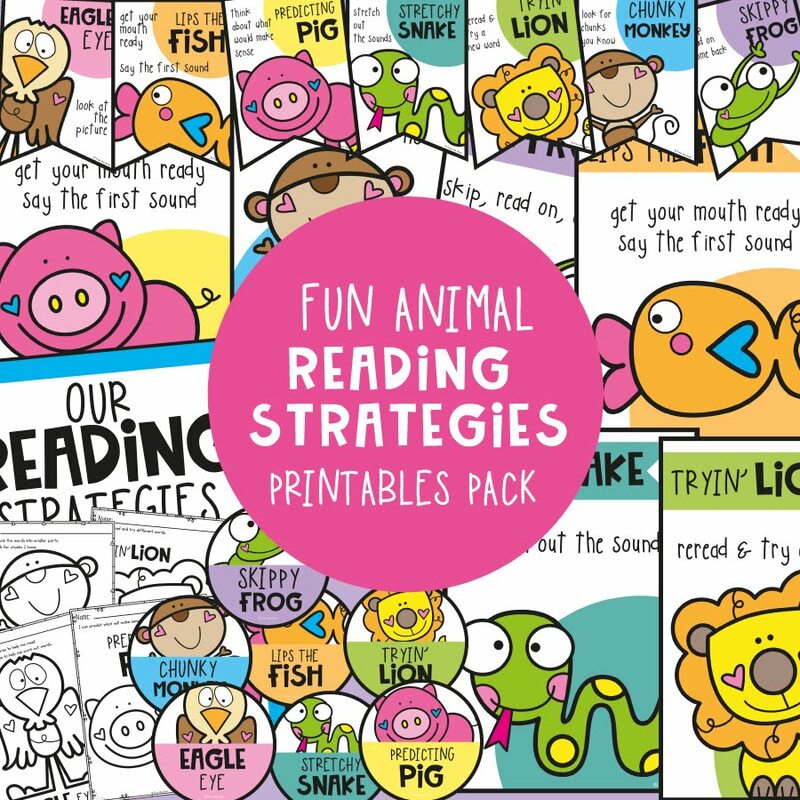 I have long had a love for teaching resources, and was excited to find that there were other people like me around the world that wanted to 'see' and 'read' more about resources, teaching materials, worksheets, printables and lesson plans. I have also enjoyed sharing stories and anecdotes about my life as a wife, mother, teacher and tea drinker as well. Thank you for appreciating my random-ness and hodge podge of postings. You know, sometimes in life you just have to 'go with it' - so I am told - so from then on, I accepted, embraced and became comfortable with my 'randomness'. It suits my life right now, and it is truly reflective of 'me' at the moment! This is my life. I cannot do a post like this without mentioning my 2 biggest blogging inspirations, Mrs Jump and Mrs Wills. I found both blogs early on, and I have been an avid follower ever since. My heart will always be a 'kindergarten heart', and I love that their 'kindergarten-ness' shines through in everything they do. Thank you for all the inspiration and support ladies! I have also 'met' hundreds of other teachers and bloggers through my posts and feel it is a true blessing to be able to do this! 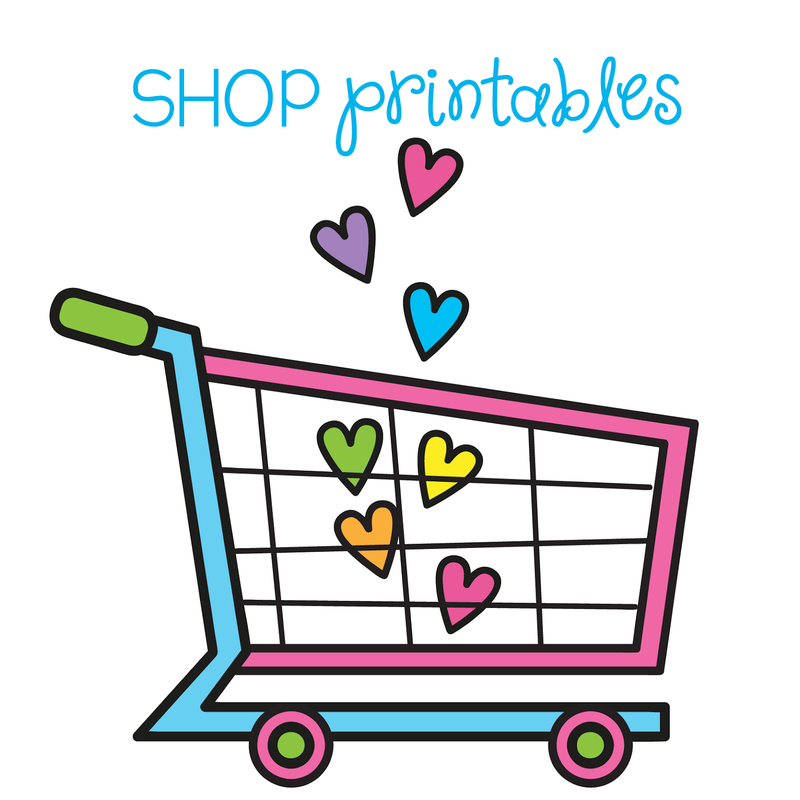 To celebrate this little milestone, I am giving away 4 $25 TpT gift vouchers. Just enter your details in the rafflecopter. Thank you so much for visiting my blog and I would be thrilled if you kept visiting. 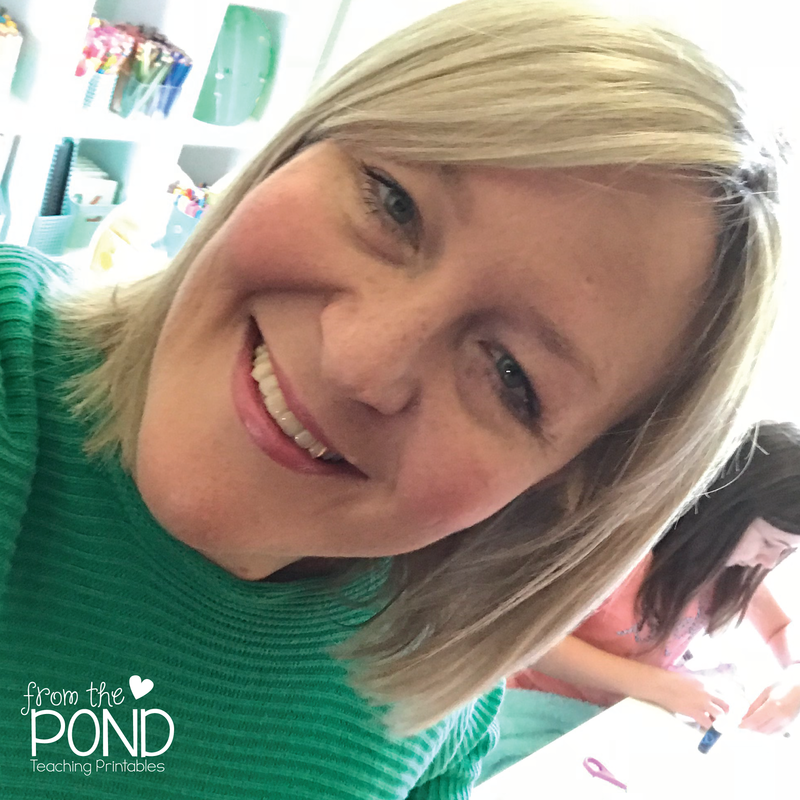 A big part of my blogging journey has been about connecting and joining in with other bloggers and teachers. I would love to do that today as well. If you have a teaching blog, please leave your link here, so I can visit and get to know you too! We made green play dough today, and it was not to make frogs. Although, I am sure that will happen at some stage this week. My new 'Fun Play Dough' packet has students making 'monsters' to help with addition and fine motor strength. All you need is the printed play dough mats (laminate them), some green doh and wiggly eyes. Encourage your students to say the rhyme as they work with their dough. The rhyme will help remind them of the dough-manipulating skills you have taught them! and patting with a firm flat hand down on the table to flatten and make a 'pancake shape'. This will make the monster body. And instructs them to share them equally amongst the monster eyelids. Students can finish off their monster by dragging their fingertip through the dough to make a 'frown'. 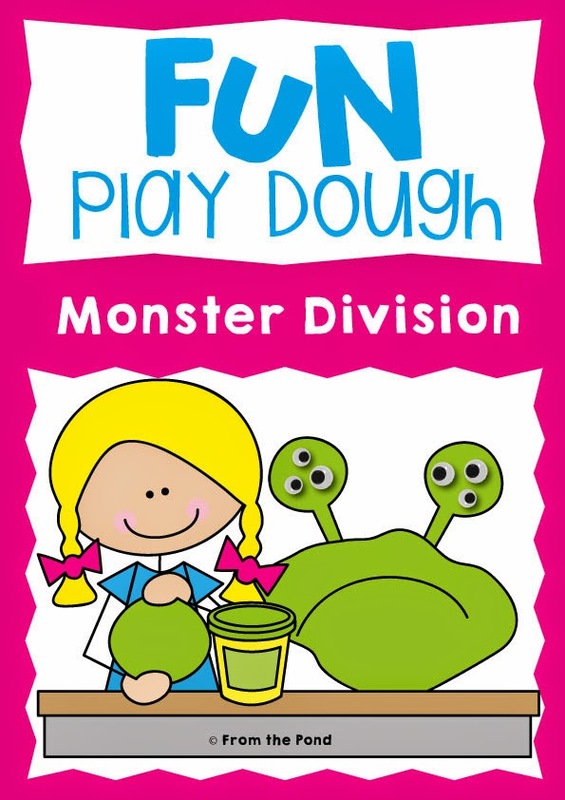 In this activity, your students are not only learning early skills for division, but essential play-dough skills that will help them bring their own creative ideas to life, and build fine motor strength. They are using different parts of their hands to create different effects with their modelling. I am sure, like me, you have been surprised with how many students do not know how to confidently use play dough. A telltale sign is a desk covered in tiny confetti like pieces of play dough. These students just sit and shred the play dough into tiny pieces, rather than working with it effectively. Not long after teaching them the basic skills and providing opportunity for practice, you will see huge improvements in their creations - and even their writing and drawing. 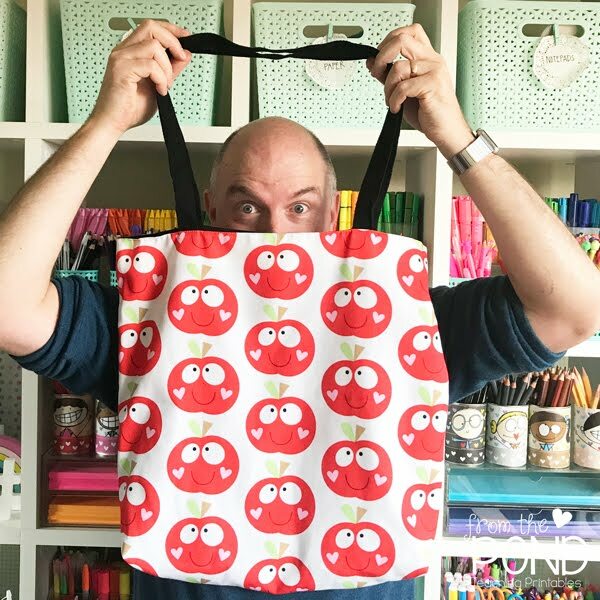 You can find my new Monster Play Dough Mats at TpT for 50% off this week. And speaking of green - I was excited to see my friend Deanna has revised her Halloween unit! I am madly prepping some activities for the coming weeks, and I know that these will be some of my students' favourites. Here is a Frankenstein Glyph that my daughter just HAD to make when I printed out the packet. I am also excited to get this 'Franken Rhyme' game ready! Students can play with partners or small groups, and listen to words to find rhyming pairs. I will be back soon to show you more activities I am prepping for my next few weeks. Oh did I tell you I will be in the classroom full time for a short time. First time in a while. Just a TINY but excited! Thanks for stopping by my friends! Have a great day! Did you have a great weekend? I hope so! I did lots of 'little bits' of lots of things I love. I never seem to get much finished lately. A little bit of cooking, a little reading, a little walking, a little drawing. Perhaps a little chocolate-eating. A little chatting. A little worksheet-making. Do you have weekends that go round and round in circles like that? 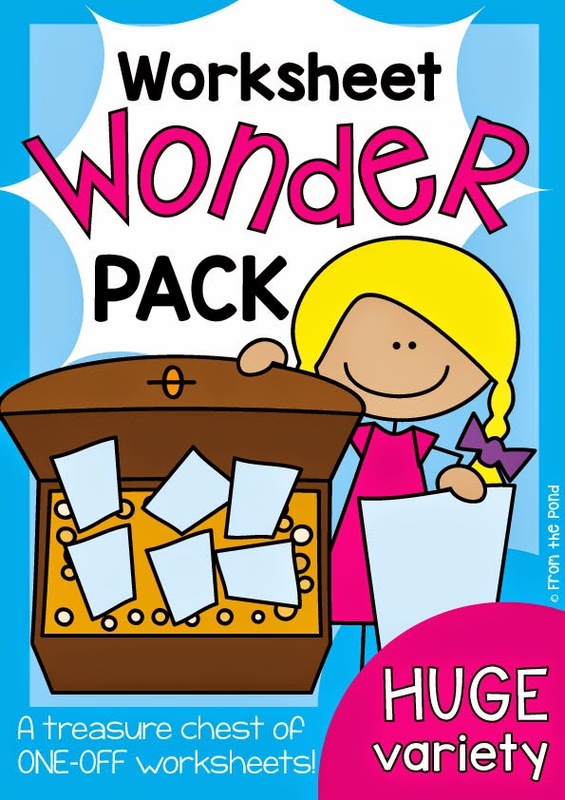 Last week I listed a new resource in my TpT store - a "Worksheet Wonder Pack". If you are new to my blog you may not know, but I am rather partial to the odd worksheet or too. The ironic thing, perhaps, is that I do not use all THAT many in my teaching. BUT, I do love to have a huge selection to choose from when I do. And when I say a "Huge Selection to Choose From" I mean, that I just like to hoard a bazillion of them, and collect them like some people collect shoes. I promise I am normal. Mostly. Am I the only one? Apparently not. Here are 2 of my 6 '4 drawer' filing cabinets that store most of them. 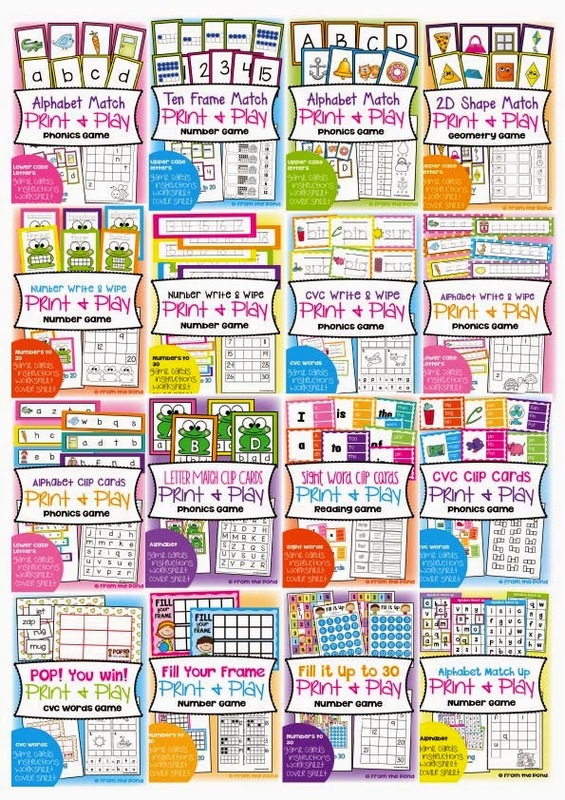 They are jam-packed with delicious worksheets and resources. I love collecting them, and I have loved making them. I love variety, I love having 'all sorts'. 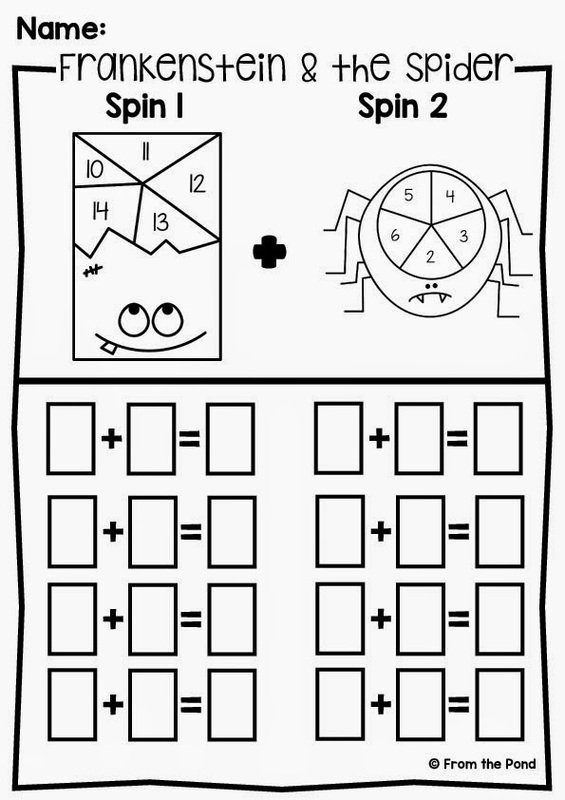 I have a big collection of worksheet 'one offs' that I have made. I get inspiration to make something and then often, they do not fit as past of a larger packet to sell in my resource store. Now I have somewhere to put them! This packet will house all my 'one offs' and I do not intend to finish this packet anytime soon. Hopefully it will grow for a long long long time to come. It is nice to have a place to put them and to see them get used! 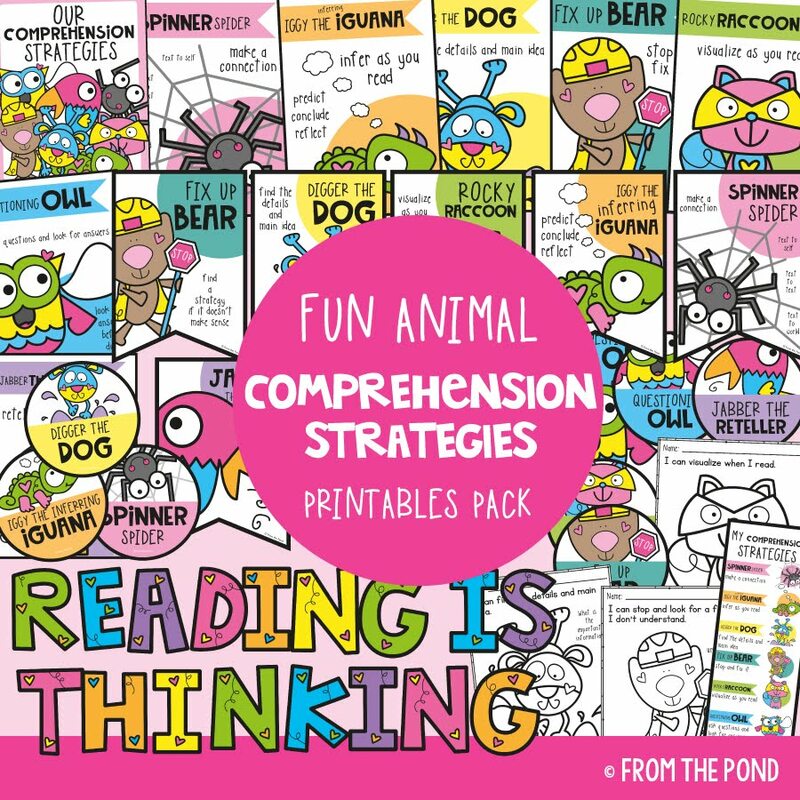 I will be adding to this packet each week, and it will be a big hodge podge of ideas to teach a variety of content areas and skills in K-2. If you love collecting worksheets, (or even if you like to use them in your classroom), you may like to check out this file. I have it on sale for a week only! 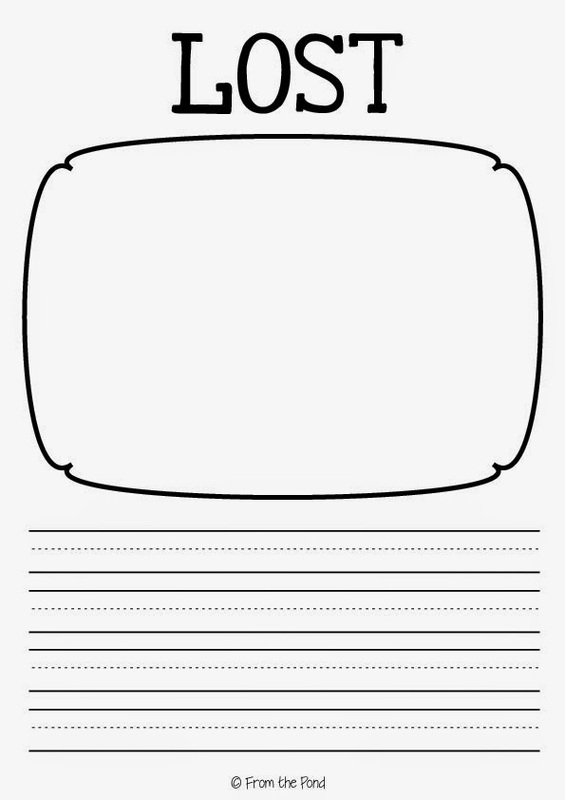 Here is an addition worksheet I made today, it is NOT in my packet, but you can grab it from Google Drive right now! Just click on the image below. Left and Right - A Bright Idea! Hi there friends! Feel like a bright idea? Well this one is a short and simple one. To help your little ones learn left from right, simply trace a left hand on yellow paper and a right hand on red. Why? Because left is 'lemon' and right is 'red'! Told you it was bright. Make your left hand into an obvious "L" position as this will also assist students to remember which of their hands is left. Now, attach these hands to the front of your classroom somewhere, on the correct side of the classroom (when the students are sitting facing the board), and leave them for the year. 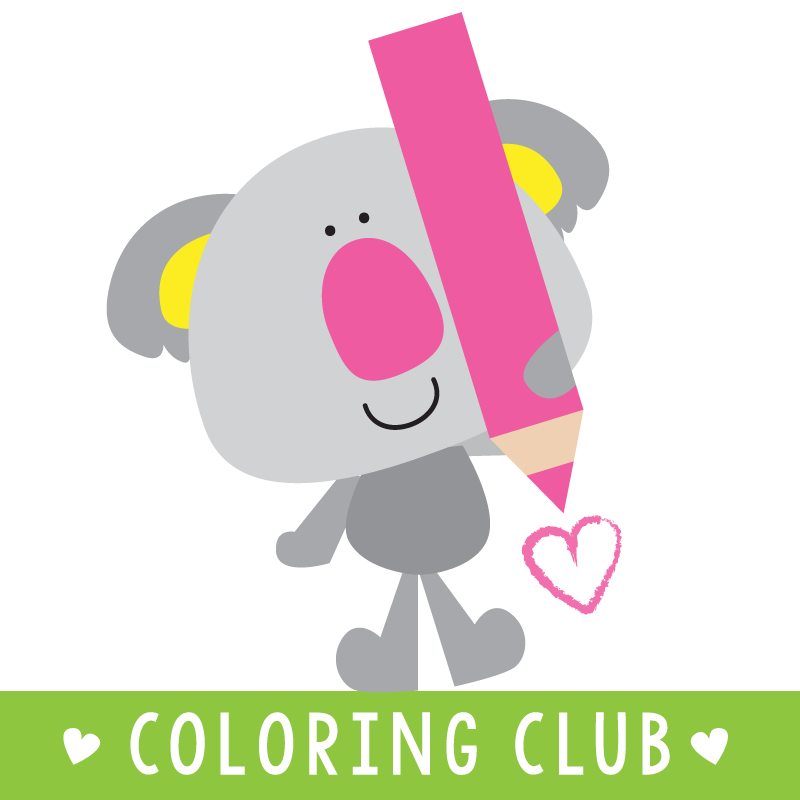 Whenever you can, incorporate the colors into the students' left and right side if you can. Pik up a red pencil with your right hand for example. Just incidental occasions through the year, when you can incorporate colors and positional language. I would love to have you follow me for more teaching and classroom ideas. 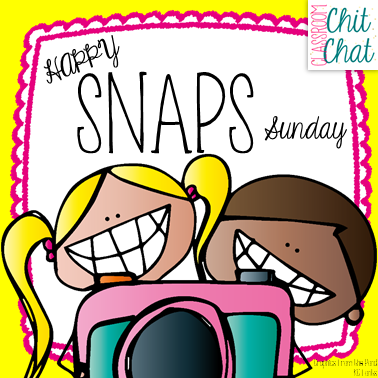 My friend Shanyn from Classroom Chit Chat has started a new Sunday Linky called "Happy Snaps Sunday" to showcase some of the happy moments in the lives of teacher bloggers! Things that make us smile. Today, I want to share with you, this happy snap of my little man and I at lunch. I fully acknowledge that I am 100% biased, but this little man is the SWEETEST! I could not have had a more perfect lunch date by my side. He was impeccably behaved, gave us lots of laughs and was thrilled to be having a water out of a grown-up-looking glass. It's the small things that make the day of a 2 year old. I can count on one hand the number of times this little man has cried or been grumpy. Seriously. I know it is not normal, and that I am super blessed to be his mother. He smiles just about all day, and you cannot help but feel happy when he is around. 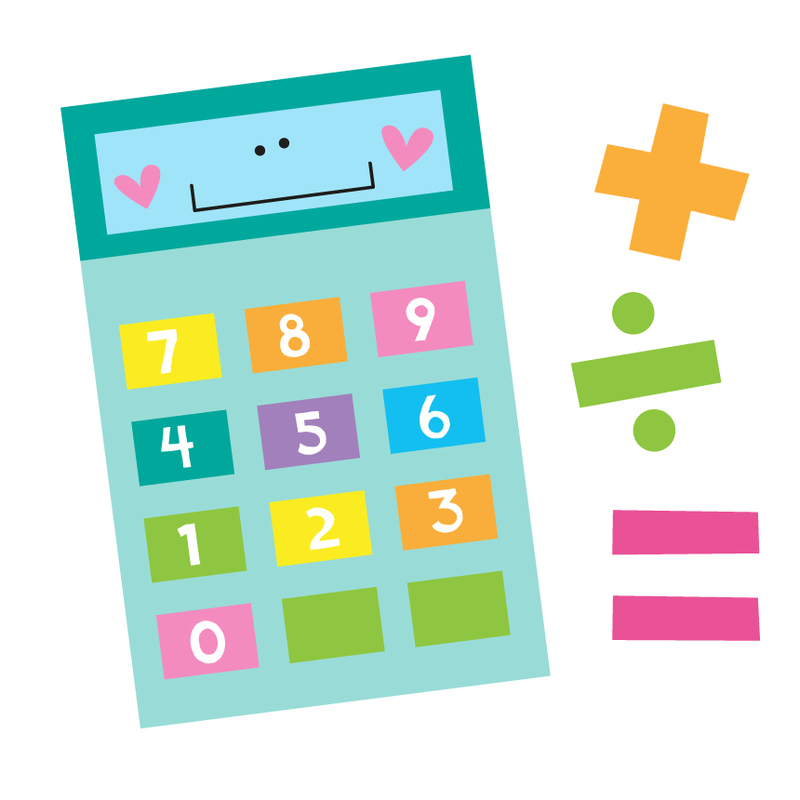 Another thing that makes me smile - is making clipart. Love it. 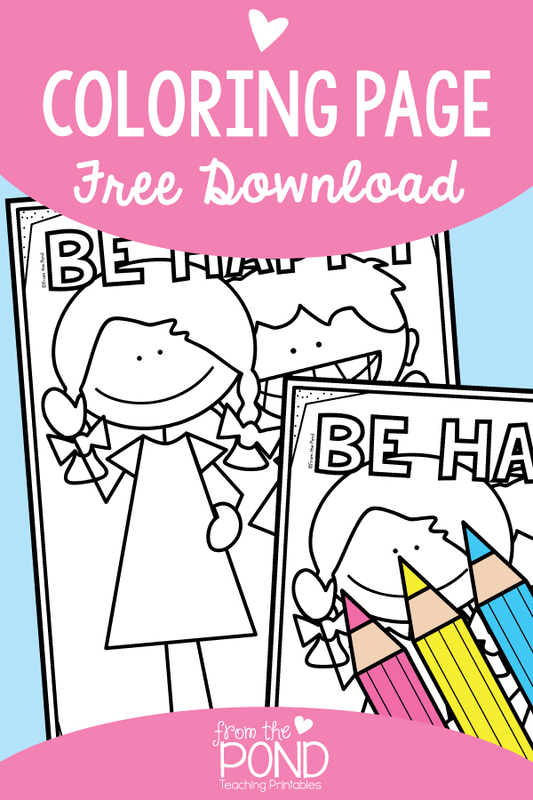 I made some happy stick kids today and created a free coloring page with them. Thank you so much for stopping by, head over to Shanyn's blog to find more Sunday Snaps! I love teaching and being a teacher. There are a few tiny things that do annoy me in the classroom, however. Perhaps the most, is that little consistently-occurring question of "what do I do now?". For as long as I have been a teacher, and a little time before that, I have told me students "Be Busy". In just 2 words words, I am telling them both WHAT to do and HOW to behave. When I first introduce them to this idea, we explore what being 'busy' looks like. I have had "Bee Busy" stations set up in a few different ways. I have has a stand of trays used for various activities, a table with little containers and baskets, a Bee Busy Cupboard and a pocket chart holder. 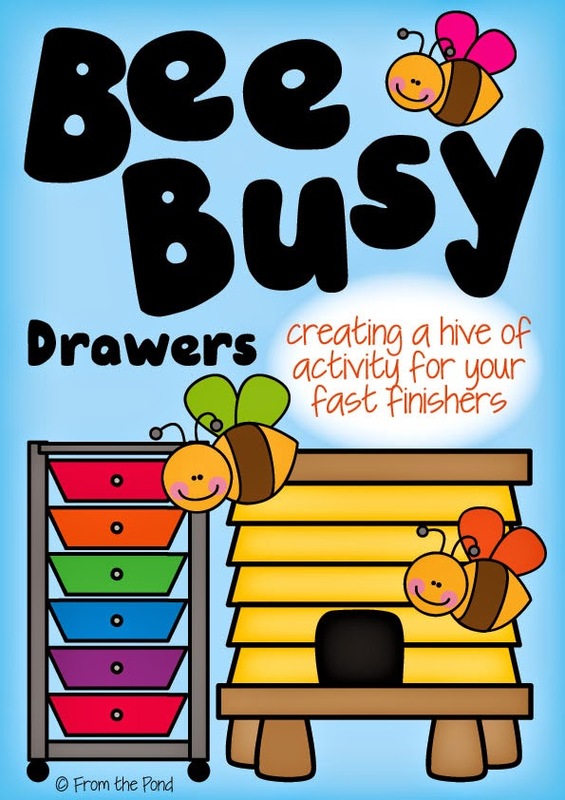 Over the last few months, I combined all my ideas in one big packet - the Bee Busy Drawers. Start with a 6 drawer unit (or more if you need it)! Each drawer houses a different STYLE of activity. This is the important part. The goal is to have your students as independent as possible. If the drawers stay the same, students will become increasingly independent and focused each week. It also makes it a very flexible teaching strategy for you - you can add ANY printable activity you already have, or find on sites like TeacherspyTeachers and incorporate it into a framework your students are confident and happy with! On the top is a cup of popsicle sticks. Have one for each activity, matching the color of the drawer. If you have 4 activities in the green drawer, have 4 green sticks. When students take an activity out, they take the matching stick. This will help with classroom management, students become more responsible for returning equipment and can quickly see what is available. It also gives you an avenue for designating activities to particular students should you need to. The top drawer is where you keep all your bits and bobs - pencils, dice, clips etc. Label each drawer, so the student become familiar with the activities and can return the equipment properly. For each activity, think of the simplest way of presenting it. I like elastic bands around the cards, but you could also use baggies, small containers or pouches. The less fuss, the more attractive to students that are eager to do something. It also strips back your classroom routines. Your students will be engaged in a focused skills based activity in a a matter of seconds. Why is this important? Well, you can use up those little 5 minute blocks of spare time and make them irresistibly valuable! I hate wasting time, and like to squeeze every once of learning I can into the school day. 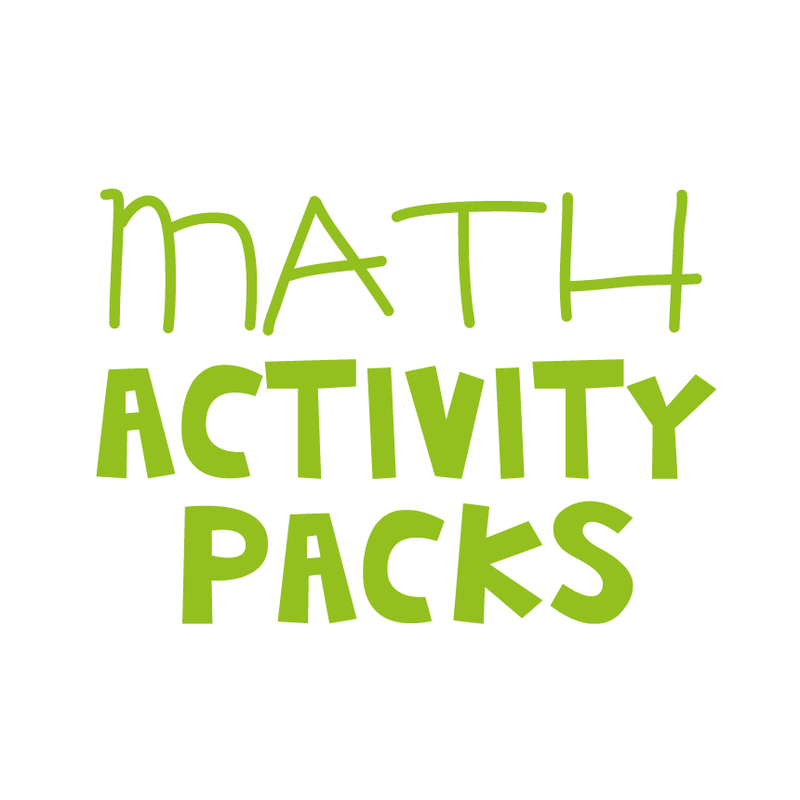 My packet includes 16 activities to get you started. That is 4 per drawer. I have selected activities that focus on the basics. The idea of a "Bee Busy" station is that students are reinforcing and consolidating skills already learnt. No need to monitor, assess, regulate. I took extra time to 'package' these activities as 'Print and Play Games" - if you use my resources you will know what I am talking about. These are packets I make to use in small group rotations and center-based learning time. 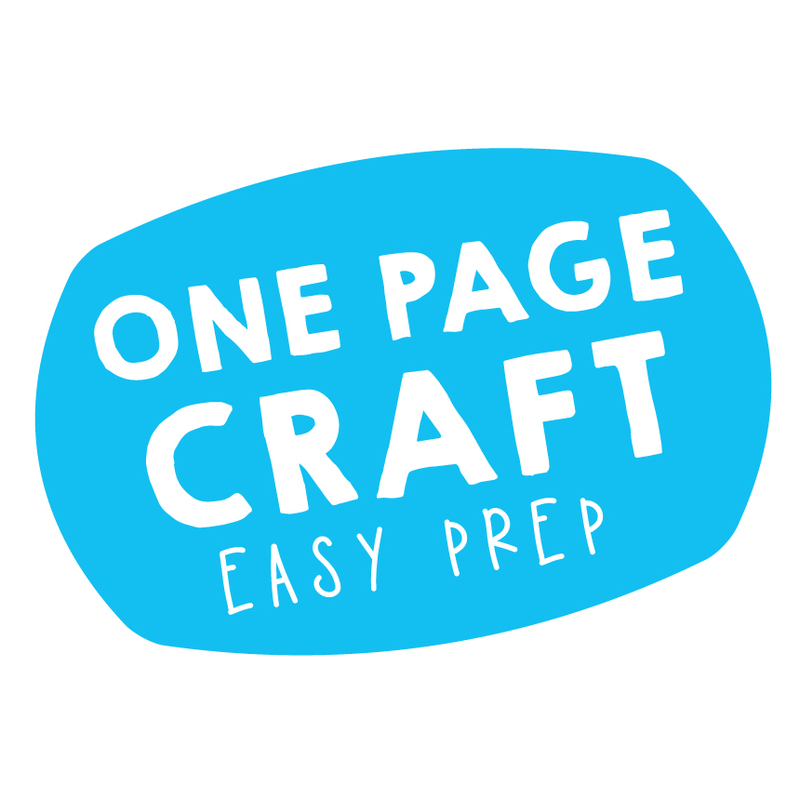 Each file includes a cover page, worksheet and detailed instruction sheet that is handy for giving to an adult helper working with your small groups. These additional pages are not necessary for the Bee Busy Drawers, but I included them so that this packet can be multi-use to you! Once you have used them in the Bee Busy Drawers, you can file them away for use in other areas of your program. Yay! If you would like t o try my 'Bee Busy Drawers" idea, I have just listed it at TpT. 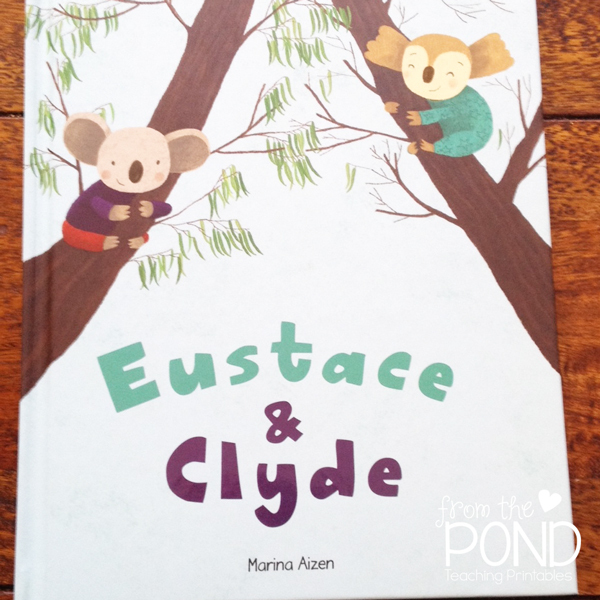 Today I would like to show you Eustace and Clyde by Mariana Aizen. 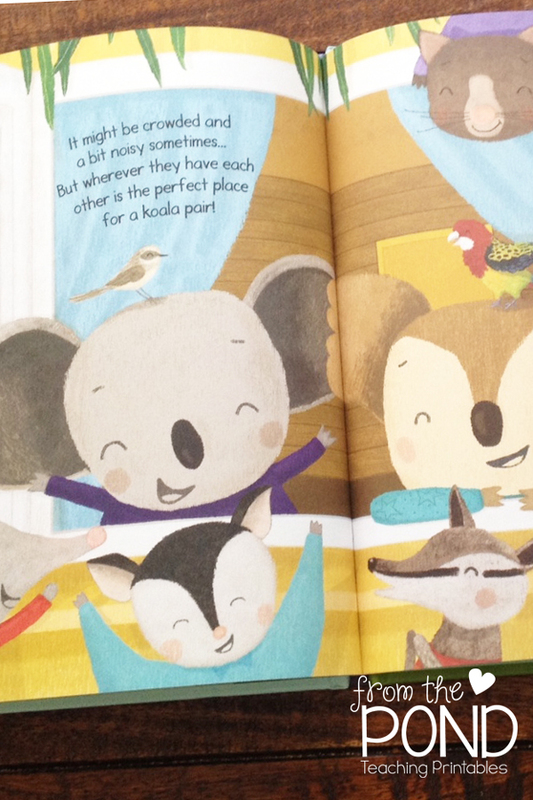 I have to admit, the insanely cute koalas and funky-chunky-font on the cover drew me in! After a quick flick through, I knew I had to have this book. 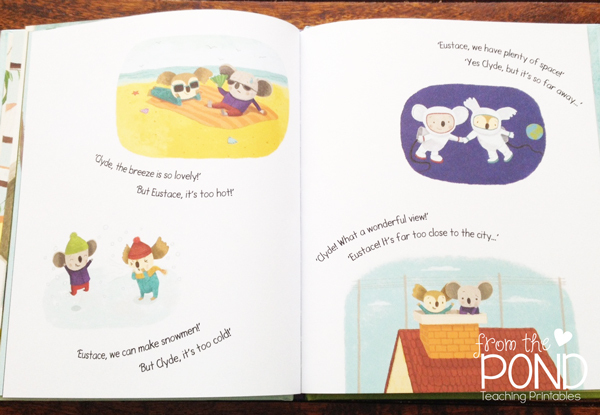 Eustace and Clyde are two koalas that are very different - yet they are true friends. They set out in search of the perfect home, where they can be a happy, content 'pair'. No place seems quite right. The breeze is lovely on the beach, but it is just too hot. The thought of making snowmen is inciting, but it is just too cold. right back where they started from. They realise that wherever they have each other, is the perfect place to be! Honestly, my daughter, son AND I just want to look at these adorable illustrations over and over. 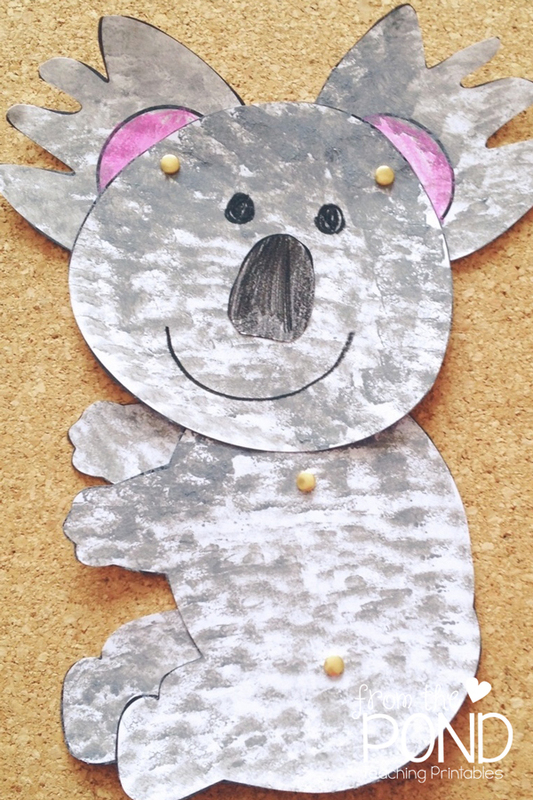 I made a koala craft that you could use after reading this story to your class. Just copy the templates. Prepare some trays of grey paint and some small sponges. Ask your students to dab paint over the template pieces. A nice thin layer will dry quickly. Alternatively, you could ask them to shade with crayon. Once cut out, you can assemble all the pieces with split pins (brads/paper fasteners) so that the arm, leg and ears move! Your students can then draw a face. I am so happy to provide this craft to you as a blog-exclusive today! Click HERE to find the file in google drive.